Mangrove swamps are very important ecosystems. 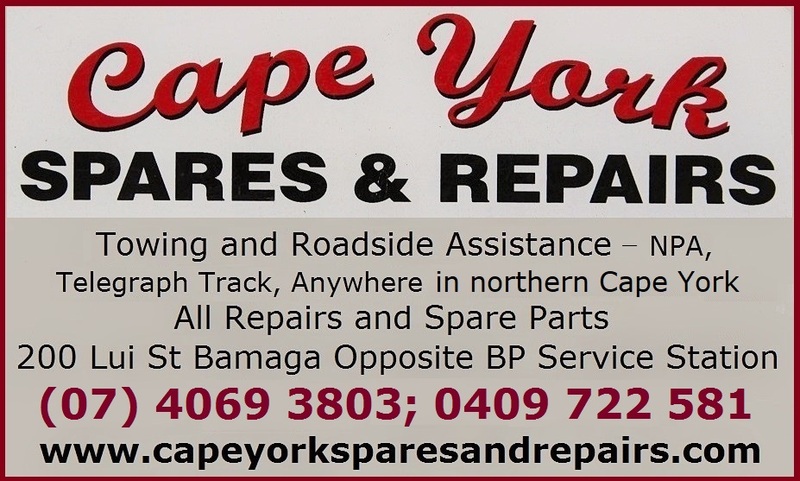 And in Cape York there are a lot of them. They are on all coasts of the peninsula, in all estuarine river mouths, and the good thing for you as a traveller is that this is where you can do some excellent fishing and mud crabbing, and may even spot a deadly saltwater crocodile. What you likely notice less of is the species variety of mangroves themselves. 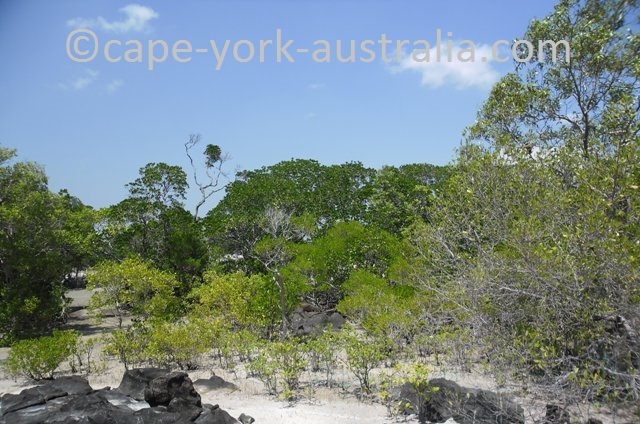 Cape York has every species of Australian mangroves - about 30 of them, while down south there are only two. Mangrove ecosystem is a more important habitat than previously thought. It is a nursery for juveniles of a lot of different fish, amphibian, reptile, bird and mammal species, and it also acts as a filter for pollution, and protection from cyclones. 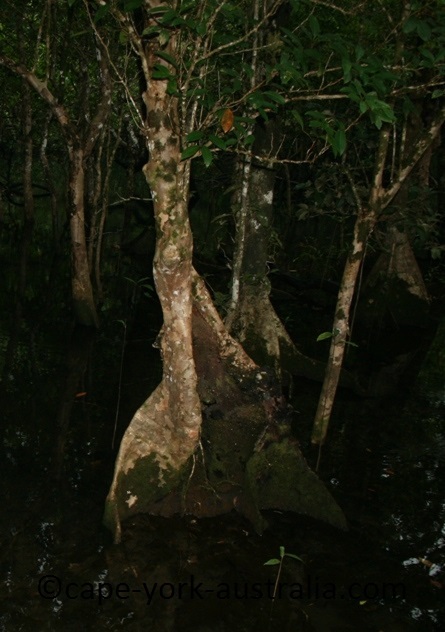 Mangrove trees are not necessarily related to each other. Unlike other groups of plants such as eucalypts, ferns, cycads or palm trees, mangrove plants can be of very different origin. The only thing they have in common is that they tolerate saltwater. But every species tolerates the saltwater to a different degree. This creates a zoning in mangrove swamps, where grey mangoves are at the waterfront, with red and then yellow mangroves, and finally salt march and casuarinas on the higher grounds. But one of the most amazing things are of course mangrove roots. There are a few different kinds of them (pneumatophores, stilt and buttress roots), but they are all half way above the ground. This is to keep them from drowning when the tide is in. Like other roots, they need to get oxygen. Mangrove seeds can perfetly survive after floating in the water for a long time. While most other plants need to use a seed spreader like a bird or animal (which means the 'cost' of growing fruits), mangroves simply spread their seeds in moving water. Mangrove swamps are very rich in animals. There are many species of fish, including mangrove jack and barramundi. 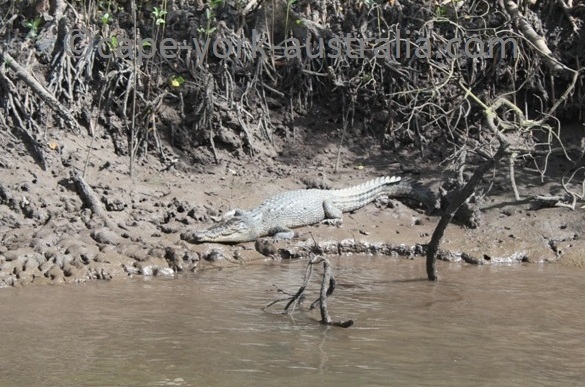 There are mud crabs and mangrove crabs, oysters, many species of birds, and reptiles like snakes and saltwater crocodiles. 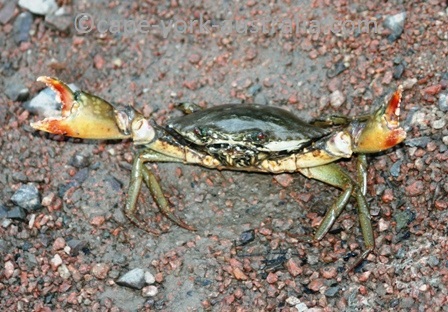 Mangrove crabs is a vague term and can apply to any crab that is living in mangrove swamps. It can apply to many different species, including our favourite - the mud crab. Like other mangrove animals, they are an important part of this ecosystem. Mangrove swamps are a very productive ecosystem that grows in tidal, salty or estuarine water on or near the coasts. 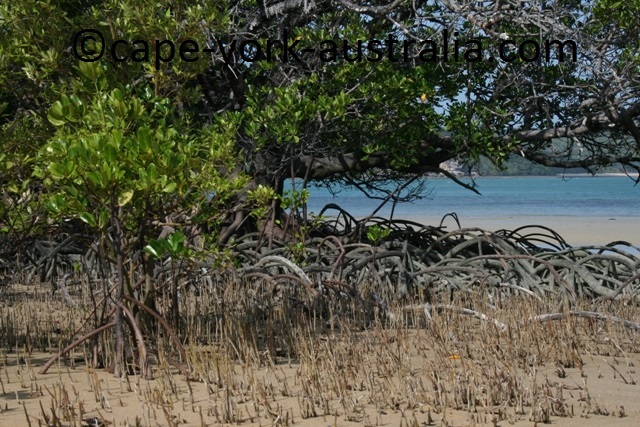 Worldwide there are 80 species of mangroves, in Australia there are 30, and Cape York peninsula is known for being the richest place, having all the 30 species while on the southern coast of the country there are only two. Mangroves are mostly trees, but the group is not taxonomically related - unlike say Australia's 900 species of eucalypts that are all related to each other, mangroves don't have to have anything in common to belong to the group, except the ability to tolerate salt. The salt toleration is obviously a 'cost' without which the life would be easier, but mangroves bear that cost to skip competition in other environments, because they are hopeless competitors. They are able to live in fresh water, but are not found there because they get outcompeted by more competitive plants. 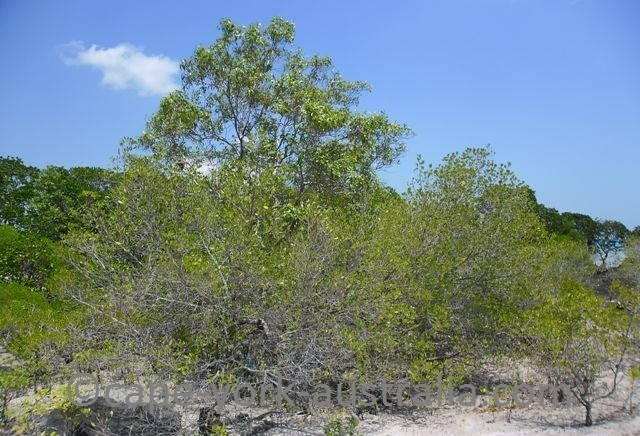 In salty environment, where most other plants cannot live, mangroves get left alone. Different species use different strategies to deal with salt. Some control the salt intake. Others have the ability to excrete salt. Yet others store water or counterbalance the salt. Different species also obviously have different abilities to deal with salt, something that creates mangrove zonation. Starting from where the waterfront is at low tide, in the front are the least salt tolerant mangroves, because at each tide this area gets washed out most. 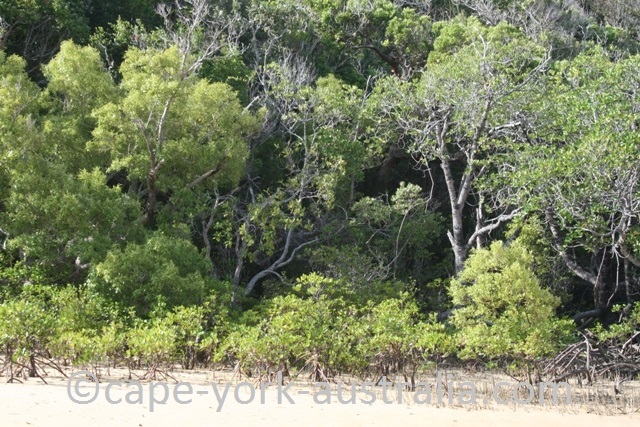 In the first zone you usually have grey mangrove (Avicennia marina), which is also the most common species in Australia, that also grows furthest south. In the next zone you usually have red mangrove (Rhyzophora stylosa), and there could be many more zones depending on the species richness, but highest up is the yellow mangrove (Ceriops sp), the most salt tolerate one. Only the highest tides reach the yellow mangrove zone, which means that the salt that accumulates there gets washed out more seldom. 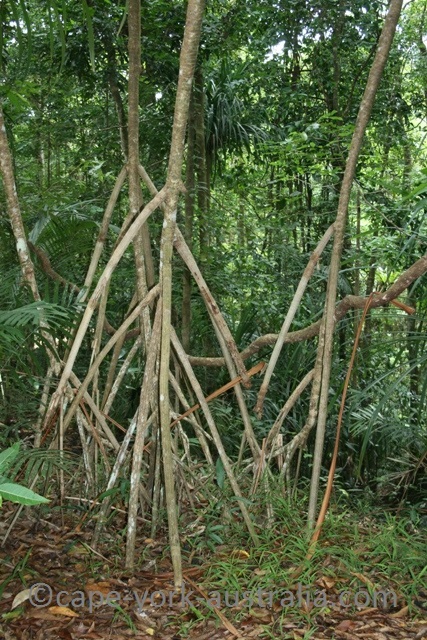 As you have likely noticed, there are many different types of mangrove roots - some more impressive than others. Salt tolerance can be part of the reason in some, but the main reason for massive mangrove roots is that without them the tree would drown. Living in tidal waters the ground will be covered in water at least once a day, and some root parts at least need to stay out of the water even at the highest tides, because the tree needs the oxygen. There are different types of these roots, some most common main types are pencil, stilt, knee and buttress roots. On the photo above are two - the pencil roots are the ones that stick out of the ground like sticks or pencils, while the curvy ones are stilt roots. And on the photos below are knee roots on the left, and buttress roots on the right hand side. All are to catch the oxygen above the surface of the water. Like every other ecosystem, there are obviously also animals, and for a long time it was not really understood how much of these are in mangrove swamps. Tidal areas such as mangrove swamps are very important nurseries to a lot of species, and they are a vital part of life cycle for many of our favourite catches such as mudcrabs, and fish like mangrove jack and barramundi. Other aquatic animals include lots more different species of fish and crabs, and lots of different crustaceans, molluscs, oysters, and obviously the famous saltwater crocodile. Also lots of small worms etc that we don't appreciate, but are important for some animals that we do appreciate including barramundi and mangrove jack. On top of that there are the terrestrial animals, including possums, bats, lizards, tree snakes, pythons and a couple of hundred species of birds, some of which completely dependant of mangrove swamps. On top of the animals that rely on mangrove ecosystem, including those that do it during a part of their life cycle, mangrove swamps also act as filters for pollution and as barriers against the destruction of floods and storms including tropical cyclones. With a better understanding of those muddy and smelly waste of land areas as previously considered, thankfully they are now conserved better.